I recently saw this slip idea on Pinterest and I thought I would share with you all. By the way, if you are not already following The Modesty Walk on Pinterest, you can do so by clicking here and be part of all our interesting finds. 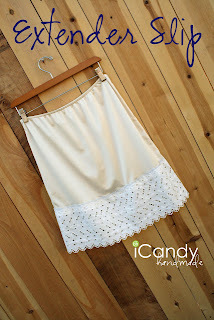 This slip idea is great for adding length to your skirts and unique cuteness. The great thing about them is that, you can create a few to re-wear over and over again, so instead of always having to add material to your skirts for length, you could use a slip with many of your skirts. The blog where you find the instructions on how to make it is here. It seems pretty simple, you just need a slip, (which you could get at stores like Sears or Walmart), the lace fabric and you'd be only one hem away from completion. I shall try to make one myself and show you the final product. I encourage you to try too! You can certainly find that kind of lace fabric at Fabric Land. A good idea is to make 2 or 3 slips of the colours which you would mostly use and voila, instantly you have a longer skirt for added modesty. Excited about trying this! Let me know if you do to, post a pic on our FB group page. Put on the Armor of Light!